The first thing I remember Bruce saying to all of us is to try something new everyday. 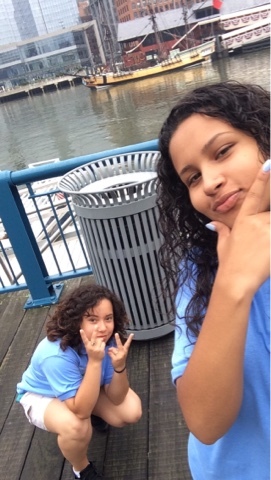 After spending this summer with Save the Harbor Save the Bay that's exactly what I did. It started off with little firsts like taking a fairy to dealing with bait, going fishing and teaching kids how to fish. 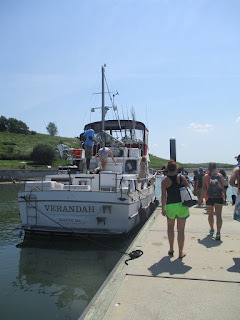 It later became more things I wouldn't have thought I'd even have to possibility to do things this summer like catching jellyfish, tie-dye, kayaking, sailing and sand raking. By the end it was things that we did to make the day more adventurous like mega kayaking as firsts. The staff and children we work with made the summer worth wild and I'm going to miss everyone like crazy. 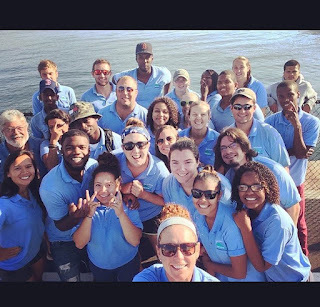 Save the Harbor Save the Bay gave me a summer filled with exploring new things and meeting so many new people and I just want to say thank you for giving me all these opportunities and hopefully more to come! 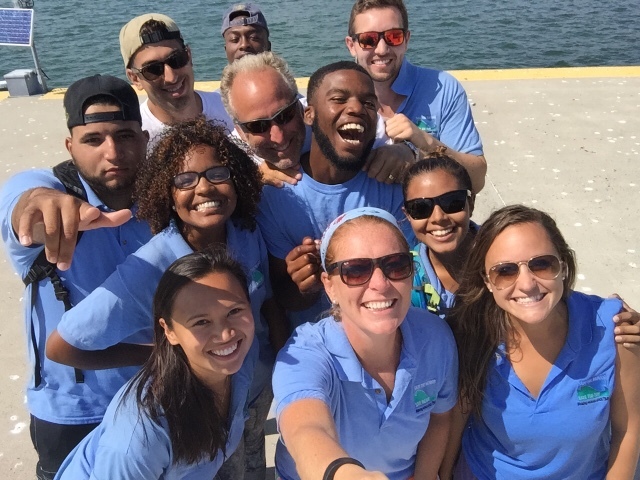 It's been an amazing summer working with save the harbor save the bay and I am glad that I took the opportunity to work with such an amazing crew! I can't express how much different this summer was compared to all my summers but what I can say is thank you. 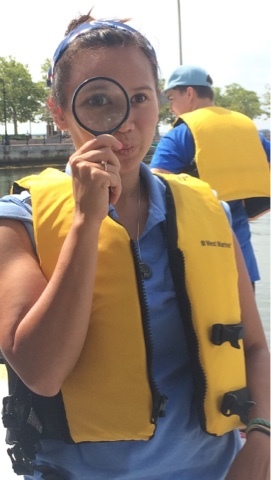 Thank you for welcoming me to work with a well recognized organization and teaching me about our local beaches, crabs, fish and so much more! I'm Going back to school soon and I'm low key dreading it because I'm going to miss working at childrens and getting used to the routine, working at carson, going on trips and not seeing everyone I've worked with this summer! Hope everything continues to go well and run smoothly as it should. Farewell and thank you for a wonderful summer, hope to see you soon. It's strange to think that my time at Save the Harbor is finished. The summer has flown by. I've had the chance to work with some wonderful people. Its rare to get a group of people so willing and dedicated to one cause. One fact that struck me was how much everyone––the JPA's, the LHE's, and the Senior Marine Educators––enjoyed coming in every morning. There are a lot of people who go to work simply because they have to, and they begrudgingly do their work. No one ever complained about Save the Harbor. Sure, we moaned and groaned about getting up early for staff meetings and smelling of fish, but at the end of the day their was no other place we wanted to be. That's amazing––really. The last couple days felt too fast, but then again the summer felt too fast. I had the chance to be on site with some great JPA's. I really liked working with Abdi, Ivan, and Jayda on my last day. They knew how to have fun, laugh, and play pranks on each other while also doing what they need to do. I have been with other groups on site who were very serious and didn't talk during our down time, and others who needed to do a little less talking, but striking the perfect balance makes the day feel easy and fun. I received a gift on my last day––a best friend. A little girl came up to our site, Adelaide. When she saw the crabs, I swear she fell in love. She couldn't stop touching them, asking questions, and showing other kids. She even helped other kids get over their fears. One girl came up and was scared to touch the crabs. So Adelaide, holding a crab in her hand, said: "See their nice. You don't have to be scared because I'm holding it. You can hold this one. It's not scary." Adelaide gently put the crab in the girls hand. One day, I swear, she's going to be a teacher. She didn't leave the site for forty-five minutes. 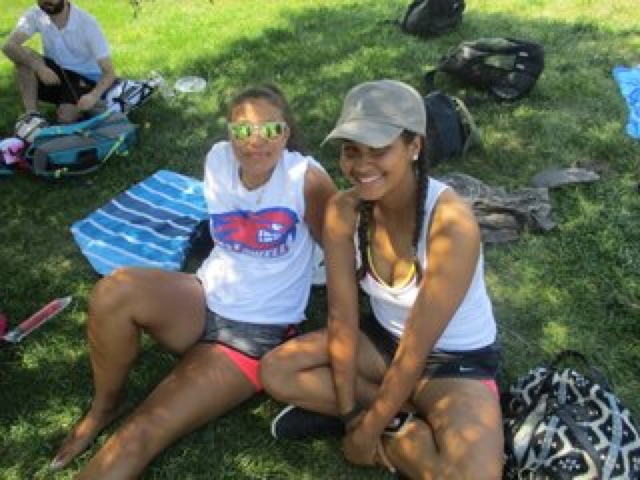 We talked, touched crabs, and she helped me pull up the crab traps. It's moments like this that I'll miss. It's been an amazing summer––the best I've had in a very long time. Goodbye until next summer. This is the last time I will be writing to you this summer. Today was my last day and j spent it with some of the most amazing people. This was such an amazing summer and I will never forget everyone I met. I am so glad to have met the best coworker EVER ! She was the best and most encouraging person. Not only were my coworker so great that wo will be seeing them sometime before next summer, but I also had the most amazing boss. Bridget was such a helpful and the most hardworking person I have ever met. She is a strong women who I look up to and will continue to look up to. I am just so greatful for the opportunity that Save the Harbor has given me and I hope to be back next year! Until next year ! All good things must come to an end, and this summer is no exception. I had mixed feelings about how I chose to spend my summer when I first started here in early July. Not being much of a writer, completing two blogs a week seemed a bit of a challenge for me, and commuting an hour and a half each day to get to work wasn't to appealing either. But after spending these past two months fishing every day, talking to new people and exploring the harbor I had lived at for so long I realized that those negatives mentioned before were nothing to complain about. After spending these past two months with Save the Harbor/Save the Bay I realized that it was completely worth it. 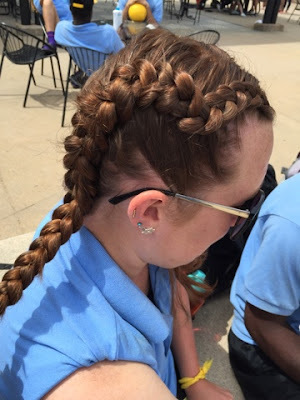 Taking part in the programs this summer allowed new opportunities for myself. I was able to learn a lot more and do a lot that more than I would have been able to if I had stayed closer to my home. I'm really glad that worked here this summer. To conclude my final day in the harbor i returned to the familiar Camp Harbor View. This past Friday was their last day too, and they have a traditional 'Hustle' they do on this last day. what this is is a camp-wide relay race, including all the kids from that session's groups. We helped in setting up when needed, but our main being there was to cheer on the kids competing. It was nice to see the kids we've been spending the last four weeks with, and the staff we've seen this whole summer, all together in this final event. Weather aside, it was a good way to use the last day. In our staff meetings Bruce always encourages us to try something new and this summer was definitely a summer of firsts. I caught not one but two fish, we caught a lobster at piers park as well as a flounder and I'm pretty sure I helped many kids really enjoy their summer. There are just so many great memories that came from this summer and I met so many really cool people. I had an amazing first year and an even better second year, I am very grateful to have been asked back to work for Save the Harbor this summer. Out of the entire summer though my top three favorite moments have to be the Beach Bash and Splash, the fishing tournament and the first week of the summer. I really hope that things work out so that I can come back next summer because this job is definitely one of my favorite jobs I've ever had. It's just sad that it has to come to an end. 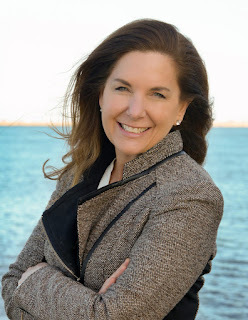 Hey, friends of Save the Harbor! My last post was about one of the new sites I visited this week, CHV, and in this post, I'm going to tell you about my day in East Boston! Piers Park Sailing is an amazing site- I happened to be there on a day of downpours and high humidity, but we still had plenty to do. After building sea creatures out of clay during some morning rain, we went down to the crab traps. 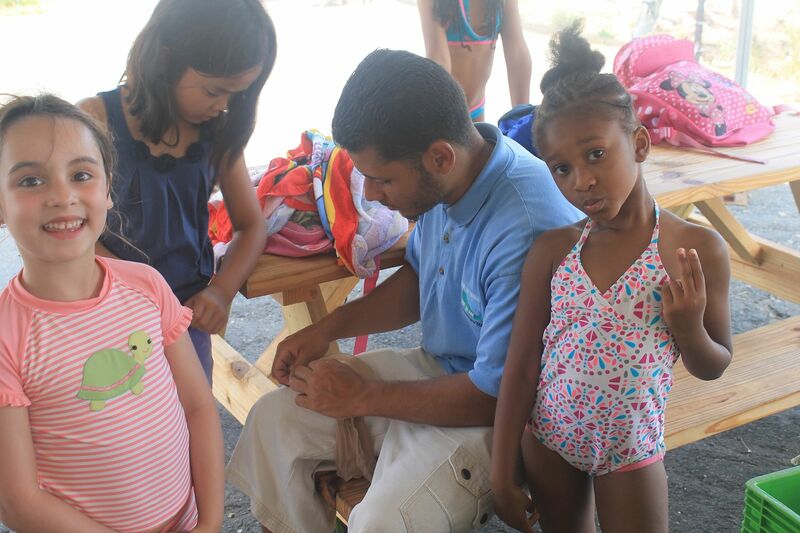 My JPAS, Andy, Ana and Bella, were incredible- they took the kids kayaking, helped me teach the kids about skeleton shrimp, and even participated in our crab race! Soon we were off to explore the parks, where we talked about genes and biodiversity while we searched for four-leafed clovers. We didn't have as many kids as we normally do because of the weather, so we were able to really get to know Friday's participants! We spent a third of our time laughing, at least! We ended the day with an amazing spin on a sailboat. 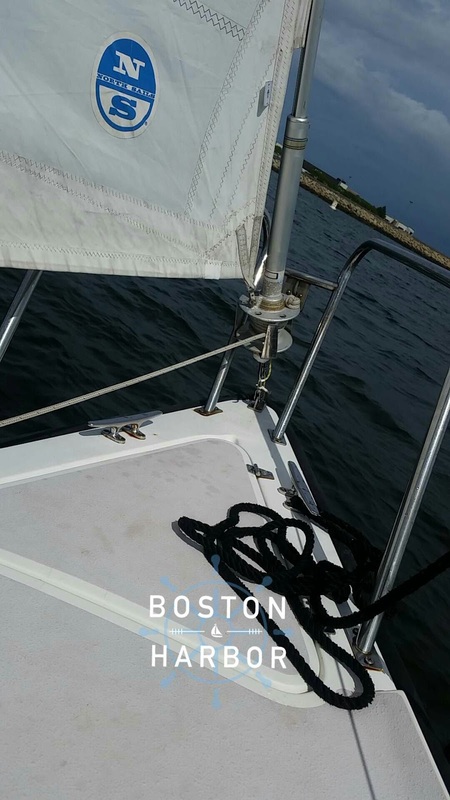 I had never been on a sailboat that size before- it needed TWO people to control the sails, and we fit 10 people onto my boat! This was a refreshing way to catch a breeze and relax after a long Friday of tumultuous weather. Thanks for always bringing me new experiences, Save the Harbor! Jessie teaching Andy how to use the broom! Fun with crabs on the doc! Though we are coming to the end of the summer, we are not winding down! I was lucky to work at two new sites this week, and I have many stories to tell! Speaking of new faces- my first skate! Camp Harbor View is remarkable. 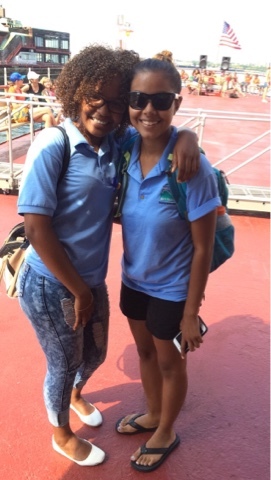 I started off my Tuesday on a big ferry, surrounded by energetic counselors in bright blue shirts. They were fun, organized and friendly. They brought me up to speed on the camp as the boat brought us out to Long Island. My two days at this camp were filled with nature walks, hikes, beach time and fishing- not to mention a few chess games at lunch! We talked about the genetic diversity of the habitats around us, and how biodiversity is threatened by environmental degradation. We came face-to-face with invasive Asian Shore crabs, beautiful bumblebees, historic forts and lighthouses, berry bushes and skates! I had my first hike on the islands, and watched a brave camper get swatted by thorns. She calmly pulled the vines out of her way, and we talked about plant defenses that occur in nature. I saw similar courage in my JPA Ivan and LHE Mark when they pulled a tricky hook out of a skate's mouth. I learned that my JPAs are expert chess players. 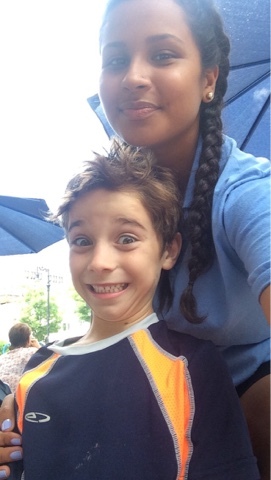 I learned about Pokemon and roller coasters (mostly from 10-year-olds.) I learned from the campers at CHV, from the counselors and sailers, and from my own JPAs- and that is what will really stick with me from this summer. 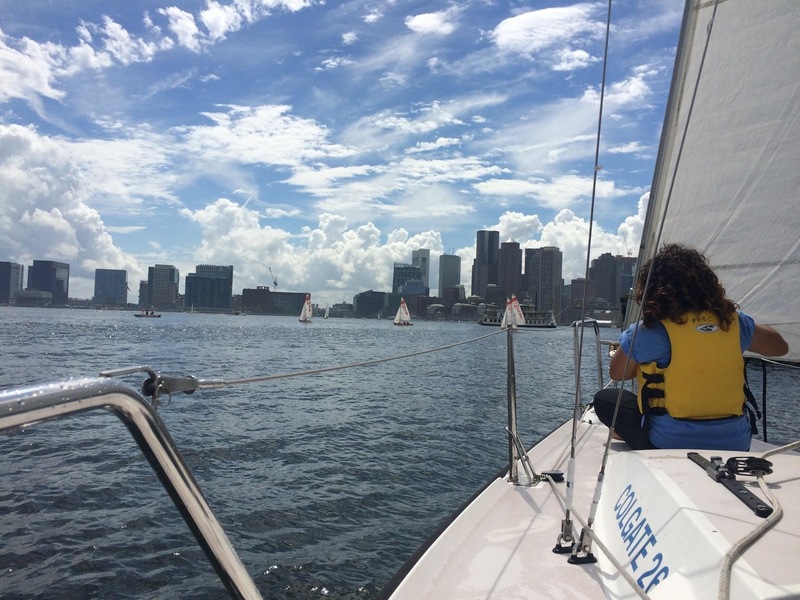 I have spent every moment, up to the last minute, discovering Boston and the treasures of its harbor. It has been one of the fastest and most enjoyable summers of my life. Thanks for being a part of the discovery, CHV! 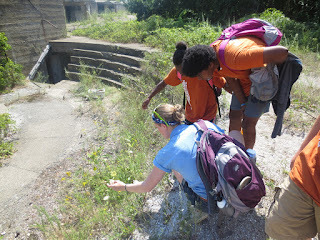 Teaching Steph and Jess about wildflowers and pollinators! This week was a shortened week for me. Monday we had staff day, and Friday our site was cancelled due to rain. Despite this, I had a really nice three days. I'm really going to miss working here. I love seeing the kids everyday and being by the ocean. Truly, that is one of the best parts about working for Save the Harbor. When I'm cooped up inside of a classroom come September, I know I'm going to be looking out the window and thinking about the harbor. I'll think about the excited kids who run up to our touch tank, and laughing with the other staff. I am going to do all I can to enjoy my last couple days with Save the Harbor. Staff day was so much fun. Honestly, we played kick ball and the boys played football. We had Bruce, patty, and sue's company feeding us and then most of us hit the beach. 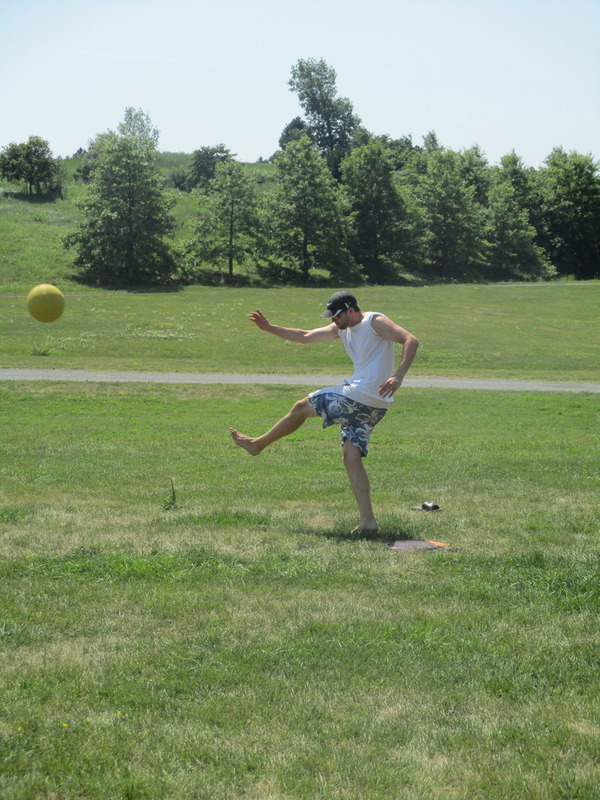 Kick ball was so much fun because one, I haven't played it in forever, and two it was a great experience playing with most of staff that I don't see everyday. The weather was perfectttt! Even though it was very hot the ocean water was freezing cold. After a while in the water I got out because my toes were getting numb and I wanted to dry off! Overall, it was really nice spending the day with people I've worked with all summer, and since we're coming to an end soon it was really great! Everbody knows that being in the hot heat with water as a companion to cool off is the best feeling. Whether it's 70 or 90 degrees, it's the best because when you want to be in the sun everything falls into place when you're on the water, near the water, in the water, and drinking water! Well, being at piers park was one of the best sites I went to. Even though I was only there for two days I loved it completely! All the kids love to play games, get wet, play in the park and sail. Honestly, there is literally so much to do except for when you're caught in the rain. Ironically, each day I came it rained and poured but for the most part is didn't stop us from our activities because it would clear up–– just for us I guess! Well unfortunately it's that time of thew year again. The days are getting shorter and shorter, kids are getting ready to go back to school, and our summer programming is coming to an end. Just like last summer, this one has been jam packed with excitement. 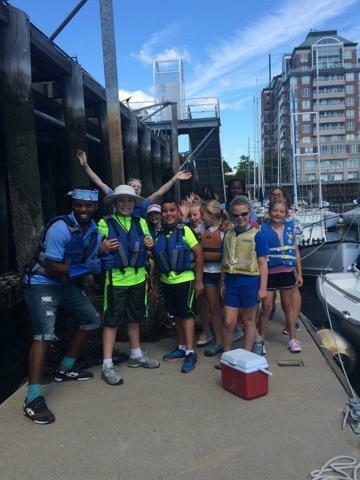 From the first day of orientation, I knew my fellow Harbor Explorers and I were going to run an amazing program. One of the best parts of my summer was that I got to travel to almost every site! My summer adventure began at Piers Park. 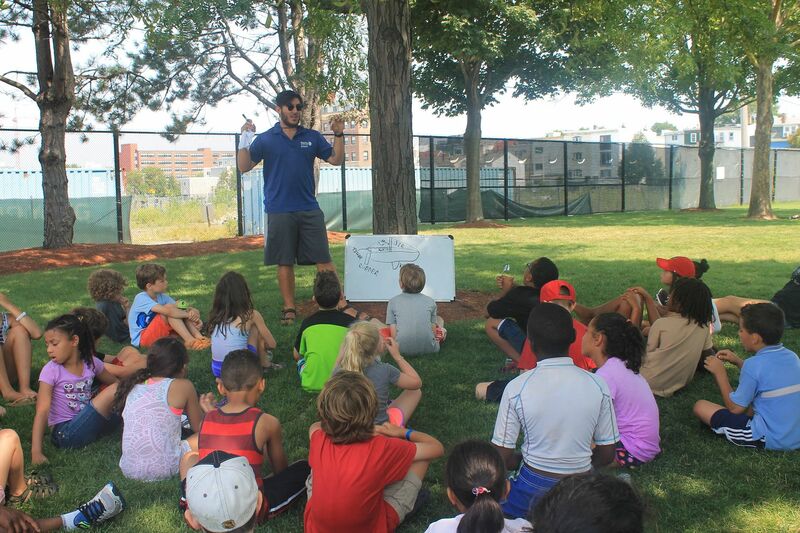 Located in East Boston, this week long day camp proved to be one of my favorite sites of the summer. 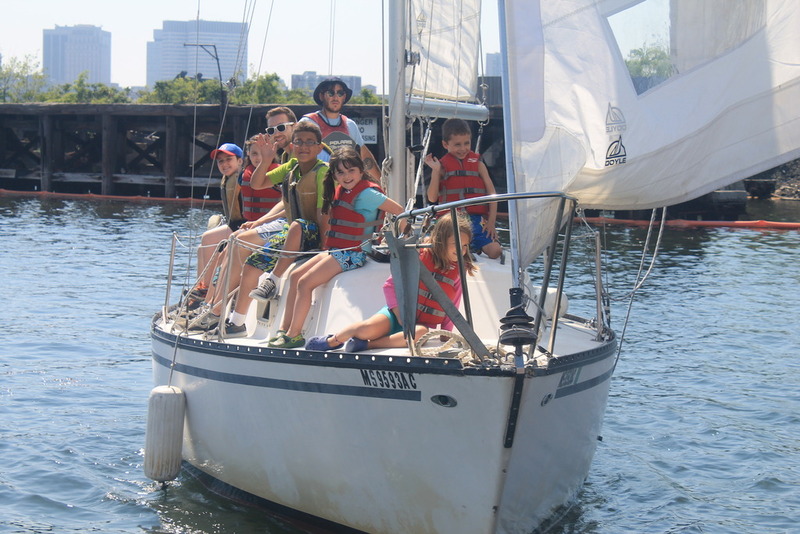 From sailing the Boston Harbor, to playing games like fishy fishy cross my ocean, we were always entertaining and being entertained by the children in the Harbor Explorers program. I learned so much from these little kids, and definitely prepared me for having kids of my own later in life. The next stop on my wild summer ride was Community Boating and Courageous Sailing Center. Having worked at these two sites last summer, I returned much the wiser and ready to continue where I left off. 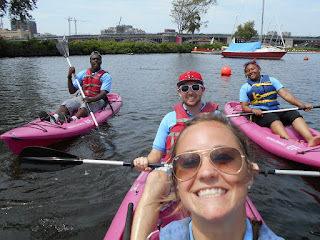 The highlight of Community Boating was taking the kayaks out on the Charles river. 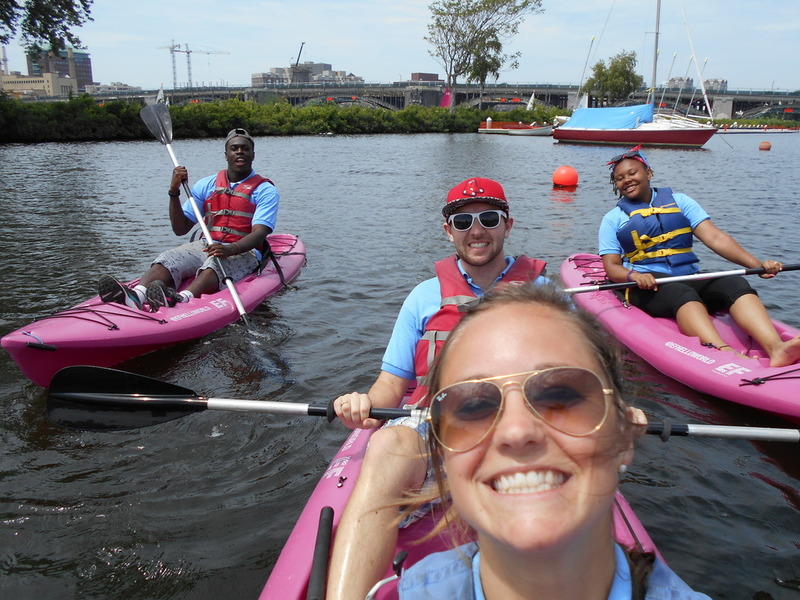 I had been kayaking many times before, but watching some of my co-workers like Dexter and Ruth attempt to kayak for the first time provided plenty entertainment. This summer we didn't catch nearly as many eels as we did last summer, but our fishing numbers were way up! It's always exciting to be a part of a child's first fish. Watching them be both excited at what they have accomplished, and also scared to touch the wriggling fish on the other end of the rod. Courageous Sailing Center continued it's excitement from last summer into this one with the abundant life we found in the multiple lobster traps we have there year round. While green crabs and tunicates were always a guarantee, the mystery came from never knowing exactly what you would find in each trap! We caught a total of 4 lobsters throughout the course of the summer, and while none of them were big enough to keep (and eat!) they were still a major source of excitement for both the children and us counselors! We also managed to snag a few different flounder, a few rock gunnels, and a few different species of crabs through the summer. Of course the highlight of every day was releasing the crabs and having a crab race to see who got bragging rights for the day. While I only one once, I didn't shy away from bragging through the day that I won! While I only spent a few days at Carson Beach, they were some of the best days of the summer for me! 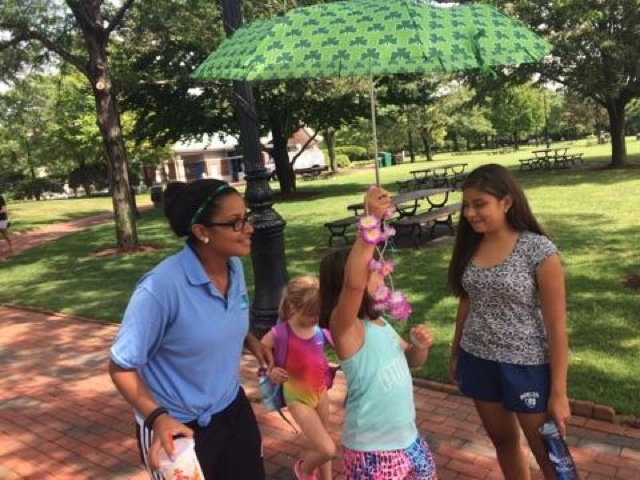 As a new site this summer for Save the Harbor, Carson had a major task of showing off one of Boston's most prestigious and cleanest urban beach! The highlight by far was working with world renowned sand artist Andres Amador creating sand art along the shores of Carson. 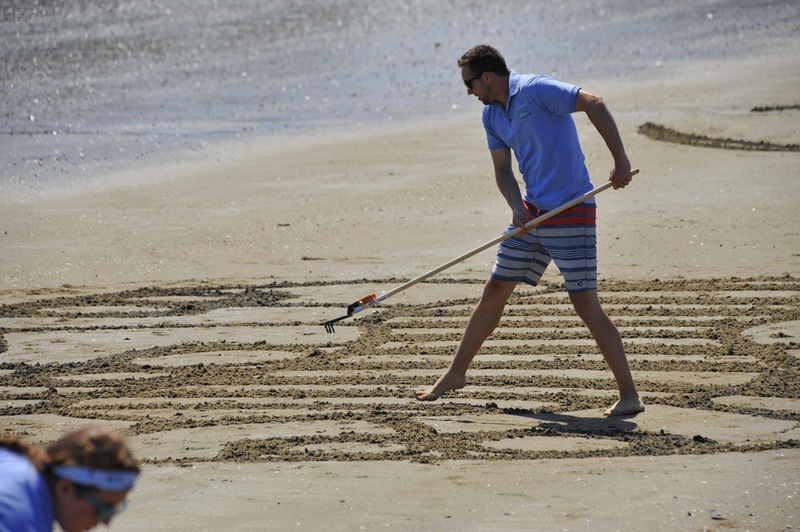 The experience was like nothing I had ever been a part of, and now I want to make my own sand art whenever I'm at the beach! While I'm nowhere close to as skilled as Andres, I hope one day I'll be able to create works of art like he can. Last and certainly not least was All Access Boston Harbor. 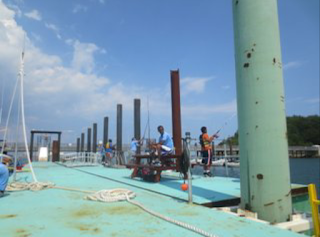 So many fantastic memories were made at the various islands we visited on All Access. From the sea glass filled shores and spacious fields of Spectacle island to the beautiful beach of Peddocks island, we helped over 6,000!!! 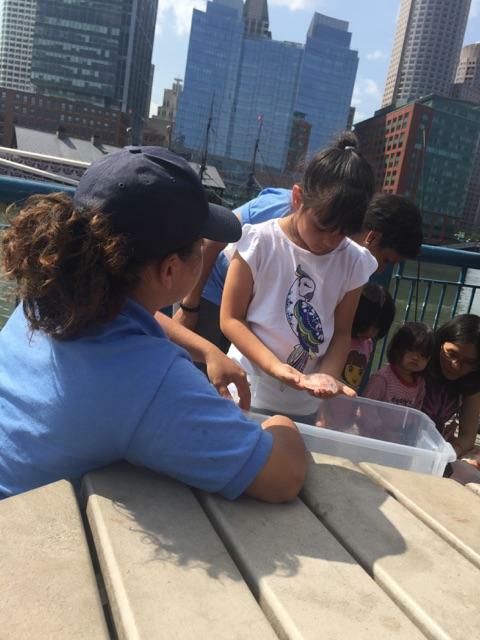 children experience what the Boston Harbor Islands have to share. 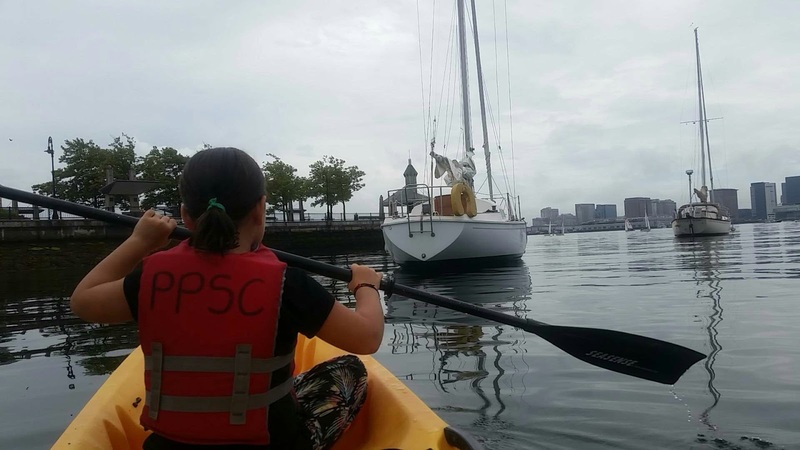 with kickball games, to beach walks and of course swimming, All Access is the perfect way to show the public just how far Save the Harbor has come in cleaning up Boston Harbor. I think I'll miss All Access the most, but that only means I'll be looking forward to it the most next summer! If there isn't a selfie, did it even happen? It's been quite the amazing summer. I just want to say thank you to everyone in the Save the Harbor Save the Bay company that made it possible for me to play a part in this amazing program. I'm looking forward to making a return next year! Until next summer, keep on exploring! Staff day was so much fun! This was definitely one of my best experiences with Save the Harbor. We started out with a wonderful ferry ride where I got to see my favorite view in the entire city: Boston receding into the distance as a boat carries me away to an island. I've taken a fair amount of trips to the Harbor Islands, and the beauty of that view is never lost on me. I savor it because during most of my week, or my month I don't get to see it. Once we arrived, we had cheese and crackers on Bruce's boat. He and Patty were very gracious. They not only provided a morning snack, they gave us lunch too. More than that though, were their words. They thanked us for doing such a great job this summer and told us how much it has meant to them. Bruce invited everyone there back for next summer, and asked us all to attend events during the year. He went so far as to offer us both professional and personal help whenever we need it. I have never had superiors like Bruce and Patty. 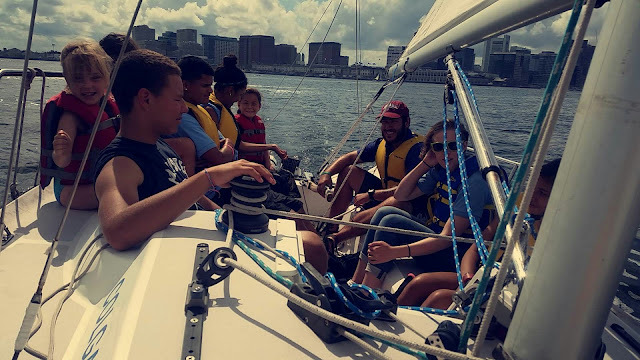 When they speak to us, I'm reminded continually why our jobs are so important, and that we're not just working for a non-profit, we're working for Boston Harbor; we're working for those wonderful islands and that beautiful view; we're serving the city of Boston. They remind us that this is our mission. In the morning, I took a hike with a few other people. Carolyn showed Ian how to find four leaf clovers and me and Nikita soaked in the sun (a mistake on my part). I really enjoy their personalities, and I'm glad I could spend time with them before leaving Save the Harbor. The day closed with lunch on Bruce's boat and swimming on the beach. It was the second time I had swum in the Harbor all summer, and it was marvelous. How lucky are we, Boston, to have a harbor to cool us on these hot days. We went home tired from a good day, sunbaked and relaxed. Labels: Mike Murray, Staff Day, Summer fun. 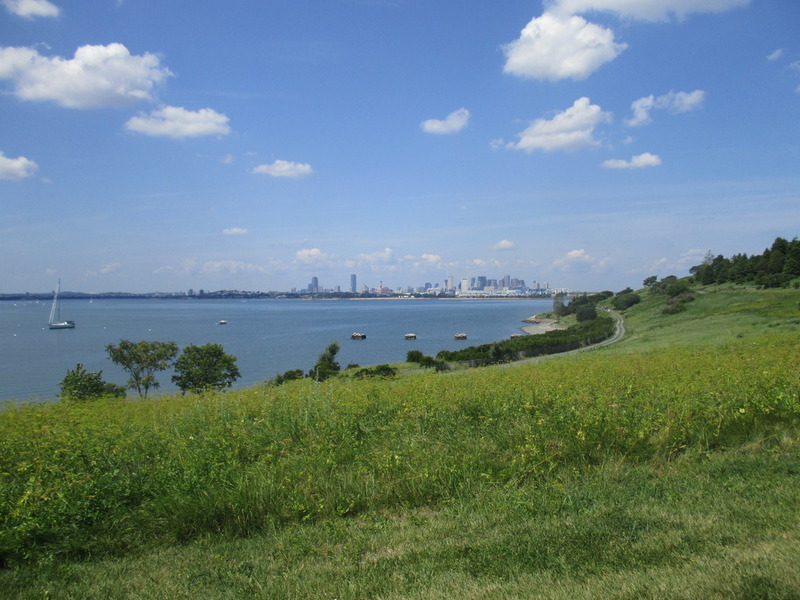 I was born and raised in Boston but I've always joked around about how I'm a tourist in my own city so it's no surprise that Monday was the first time I went to Spectacle Island. 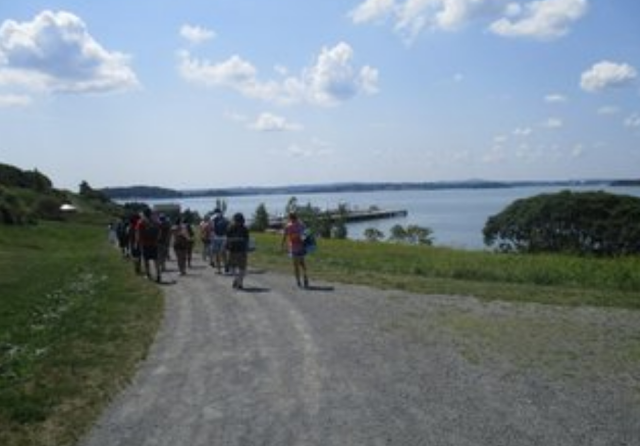 As a group the entire Save the Harbor Save the Bay staff took a staff day to the harbor island and enjoyed a day off. 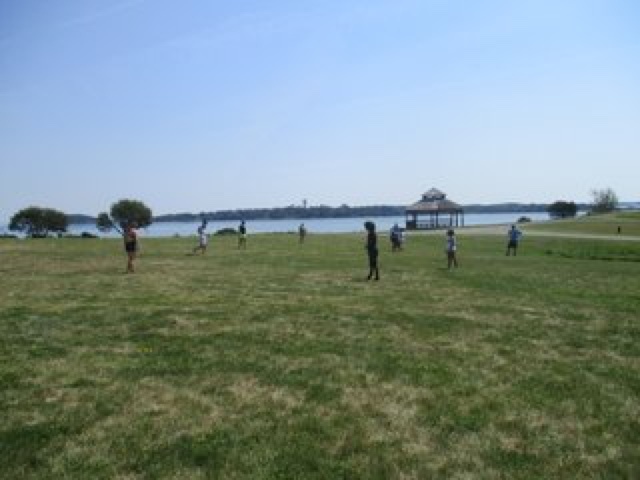 The day began with a relaxing ferry ride to the island, and we began games of football and kickball. We were then treated to lunch. After being in the sun all morning hotdogs tasted so good! Most ended the day by going for a swim but I ended it by hanging out with some coworkers I never had the opportunity to speak to. The staff day was a definite success and if given the opportunity I would make the trip back to Spectacle or any of the Harbor Islands. Friday the annual Beach Bash and Splash took place. Camps from all over Massachusetts came to participate and it was well worth the trip! We set up multiple stations for the kids. 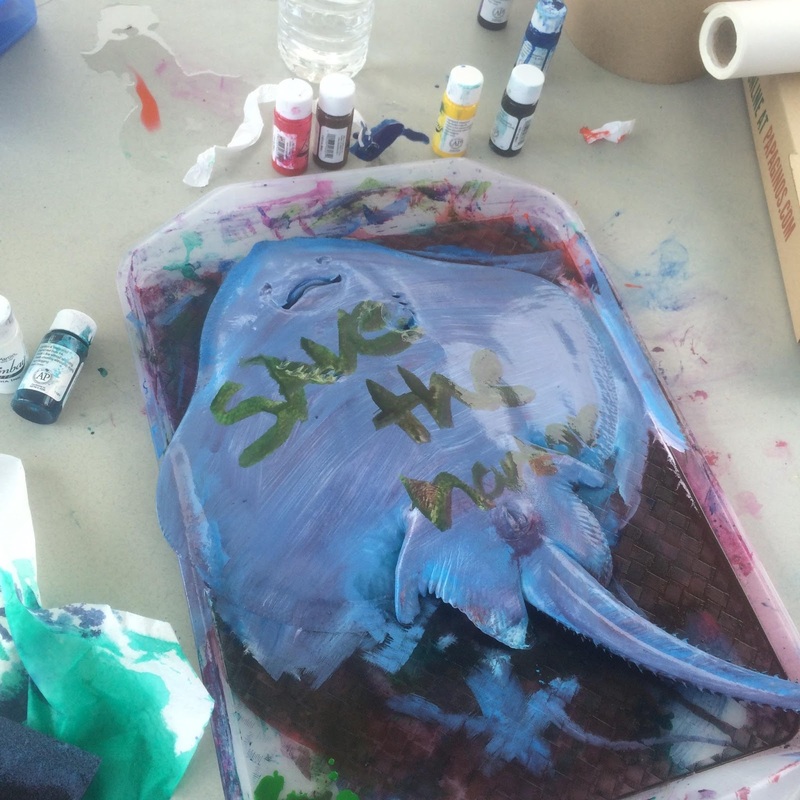 This included fish prints, face painting, fishing, clamming, sports and a touch tank station. The best aspect of the whole event had to be the splash part. The kids from all the camps lined up right outside the water and when the time came they all ran in! That had to be one of the funniest moments I've seen. 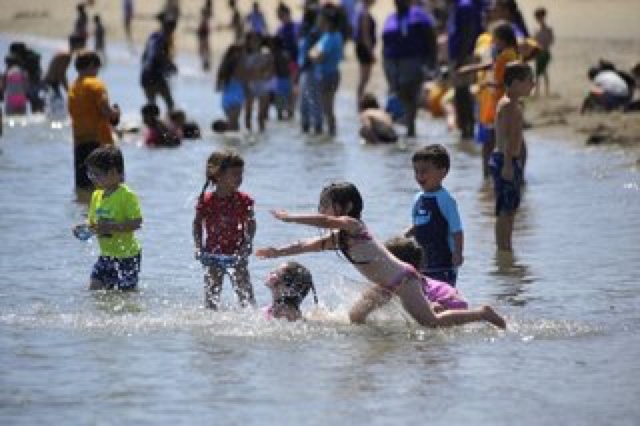 It was just save the harbor staff in the water and then a stampede of children went running, jumping and screaming into the water. None of us remained dry once the kids came remotely close to us. I hope I can participate in this event again! So Monday was STAFF DAY!!!!!!!!! It started with a nice cheese and cracker brunch at the dock of Bruce and Patty's Boat. Yum. Then, as we headed up the field of Spectacle, the boys started a game of football and the girls set up for a game of kickball. As the guys finished their football game, all staff went in on the kickball game. It was All Access Staff Vs. None All Access Staff. As the game of kickball proceeded, things got intense. There were some tumbles, so elbowing, and some miss footing from the ball. Through it all we pushed through and all access won, but you know it was just a great day having just us staff getting that game and having fun with each other. As the day ended we had some lunch thanks to Bruce and Patty and Staff Day was just the best day for us. As the summer is winding down I finally caught my first fish! And guess what? It was the second biggest fish in the tournament. To be honest I was expecting to catch anything; maybe one skate if I was lucky. 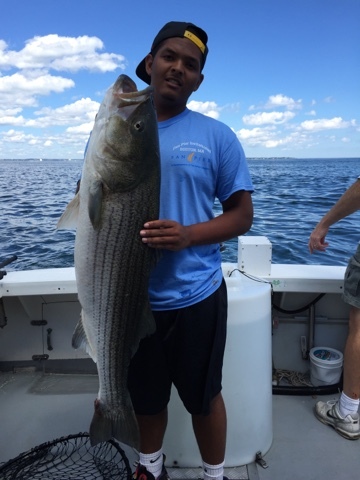 But not a huge Striped Bass! Well this just shows you, "don't under estimate yourself, always expect big things for yourself". I know that's a cliché, but who cares? I went from being a quiet kid to "didn't you win the fishing tournament?!" That just gives me a reason to be known, and more confidence to continue doing bigger and better things in life. Thank you Bruce for all the advice, I was beginning to give up on myself. I'm not a very social person, but Lindsay Phenix was probably the first friend I made at Save the Harbor/Save the Bay. 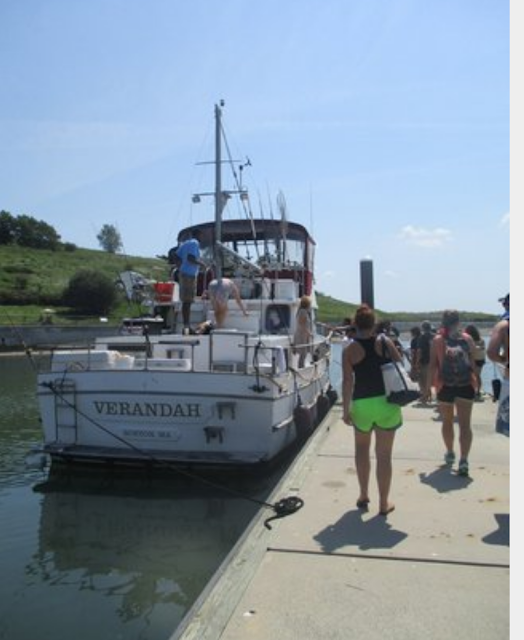 She helped me become more social, and that's very important since everyday on the boat David tells us to "DISPERSE!!" and talk to all the kids. As Bruce's favorite rapper said, "started from the bottom now I'm here", here is where I am with my All Access family. Couldn't ask for a better person than Lindsay and the rest of the AA team to show me that this is the best summer job to have. Honestly, at only 17 years old, I don't think I will ever have a better job. Save the Harbor/Save the Bay isn't just my job, everyone whose a part of it is my family, and I love every single person who is a part of it. Looking forward to my last days on the islands this summer! The Day we have all been working tirelessly towards is finally here, STAFF DAY! A day of stress-free relaxing, swimming, and of course a little friendly competition in the form of All Access v. No Access kickball. The day began with the Save the Harbor staff meeting Bruce Berman and his Wife/ President of Save the Harbor Patty Foley on their boat, the Verandah. Parked on the dock of beautiful Spectacle Island, we crowded around the Verandah and enjoyed a quick appetizer spread of cheese, crackers, and grapes that were fit for a Roman feast! Combating the intense heat with layers of sunscreen and as much coverage as possible, we tracked up the hill to the battlefield... the kickball field. 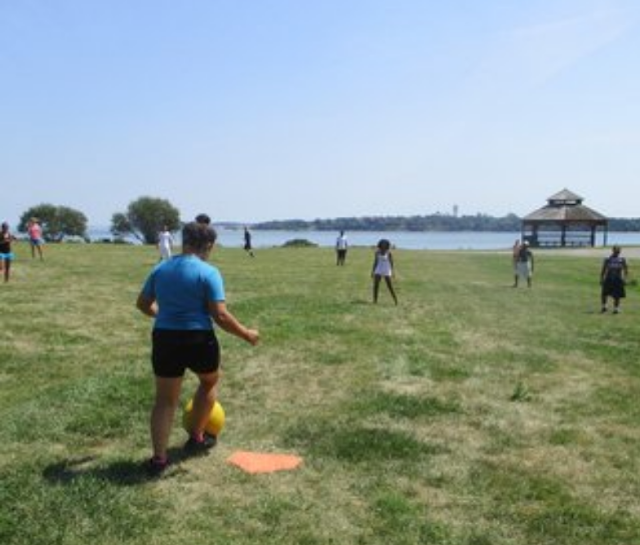 It is a yearly tradition that the staff members from All Access Boston Harbor challenge the members from the remaining summer program sites to a "friendly" game of kickball. I put friendly in quotations because this game is taken as seriously as a professional sport. Friendships were put to the test, harsh words were exchanged, and unfortunately for me, those who are not so coordinated are put on display for everyone to heckle. This year the No Access team, led by myself, came to play. For what seemed like hours (but in reality was about 30 minutes) our teams dueled it out under the intense summer heat. Fighting off exhaustion and sunburns, we played our hearts out, but sadly came up just two runs short in the last inning. I couldn't have asked more of my team in such grueling conditions, and all I can say is the All Access team better watch their backs next summer! After that intense kickball game we made a mad rush for the showers to cool off before lunch. Armed with a single grill, Bruce was able to prepare enough hot dogs to feed an army, or in this case, a hungry group of camp counselors. After downing a few hot dogs and some cookies, I was ready to spend the rest of the day relaxing and of course swimming on Spectacle's spectacular beach (pun intended). Although it was almost unbearably hot out, I could not have asked for a more beautiful day. Finally getting a day to not worry about kids or programming was a well earned relief. Since we are all distributed through the different sites all summer, it was fun to be able to have everyone at the same place at the same time. Now we're in the home stretch of summer programming, and its a bittersweet end. I'm going to make the most of the next week and a half we have left, and squeeze every last drop of fun and excitement out of what has already been an amazing summer.